We’ve said it before and we’ll say it again: Use-by dates and expiration dates aren’t strict mandates designed to save you from the brink of gastrointestinal hell, they’re more like guidelines. A new report from the Natural Resources Defense Council and Harvard Law School’s Food Law and Policy Clinic says American are chucking millions of pounds of perfectly good food in the midst of expiration date confusion. That’s quite a waste. 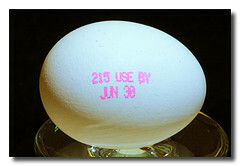 Just because the expiration date is on food doesn’t mean the food itself expires at the stroke of midnight on the date and turns into something unsafe to consume, notes Time.com. Food dating exists to indicate the freshness of the food, when that product will be at its peak. Can an expired food make you sick? Yes, but usually not immediately upon the date indicated. The problem, says the new report, is that words like “use by” and “sell by” are bandied about so inconsistently that they just feed into our widespread confusion, and hence, waste. That’s because food dating isn’t about public health, so there’s no national regulation over how the dates are used by manufacturers (except for infant formula), beyond the power of the government to protect consumers from misbranding. More than 90% of American are tossing food when they shouldn’t be, and 40% of our food supply is dumped every year because of food dating, says the report. Always use your sense of smell and sight before you chuck something — if that milk looks lumpy and smells weird, it’s done. But some other foods aren’t quite as easy to figure out. Some examples below! Eggs: If you keep your eggs in the fridge, they should be fresh for three to five weeks after you buy them. Canned food: Most canned goods will be fresh for a year after sitting on your shelf, which is what the expiration date will likely indicate. But you could also open up a can from the turn of the last century and it’d be good, as the cans are vacuumed sealed and thus, can’t let in any bacterial contamination. “People have re-open canned goods from l20 years ago and they are fine. Cans that have a date that say a year from now—you could probably have it two years, three years, five years and it will be okay,” says Leib. Meat: Common advice is to eat things like lunch meat three to five days after you purchase it. But you can also toss any kind of meet in the freezer and keep it fresh for much longer — deli meat is good for up to two months and beef stew meat can last up to nine months after freezing. It might not taste as delicious when it’s thawed out, but it’s safe.